Please Note: At May 3 (uploading date) the below is a small portion of the tack I will be listing! Please check back often to see more items/photo's as I get time to list them. If you are looking for a particular item - please email me and I'll check my stock! I have a large assortment of tack available to purchase. I have been purchasing quality stock from tack store close-outs, discontinued items, auction items etc to offer at discounted prices to buyers who want a good quality item at a reasonable price. However this also means that for a lot of the items shown, once they are sold out - they are gone! Some items are regular stock through from a couple wholesalers I deal with, so these will be re-available as sizes/colors sell out. ALL CT (compare to) prices shown are regular prices listed on the www, (ie. US dollars) which I've roughly converted to Canadian Dollars, for ease of comparing savings. [#] Number inside square brackets are quantity on hand at time of update. so if you have a horse of exceptional proportions - take a look! OUR Prices are in Canadian dollars with gst included in price. at a $5.00 s&h charge + Purolators' actual cost. Also, I will deliver within 1/2 hour of Red Deer, AB for free. Although I update this page very regularly, please contact me to confirm availability, and to get payment instructions. Paypal is preferred, I will accept cash and Canadian money orders. Sorry - personal checks not accepted. NEW TACK FOR SALE: All items packaged with original tags (unless stated otherwise). 600 Denier Nylon outer layer, NO fill, full nylon lining for a smooth, shiny coat! 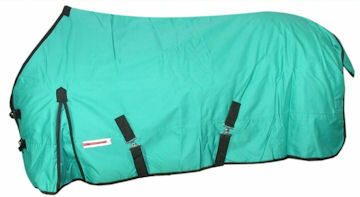 Double buckle/snap front, criss-cross surcingles, removable/adjustable leg straps, fleece wither protector and tail flap. No Back Seam - Waterproof and Breathable. 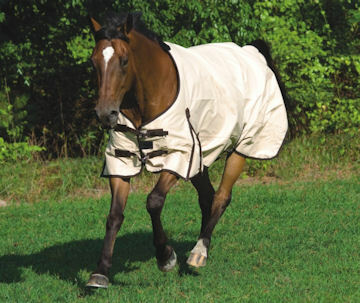 These are great blankets to wear alone to keep your horse warm and dry in cooler, wet weather, or layer overtop of a stable blanket to make it suitable for winter use as well. 1680 Denier Nylon outer layer, NO fill, full nylon lining for a smooth, shiny coat! 600 Denier Diamond Ripstop Nylon outer layer, Polyester lined, 300 gm fill, fleece wither protector, Criss-Cross surcingles, removeable/adjustable leg straps, double buckle front with velcro tab, attached tail flap. No Back Seam - Waterproof and Breathable. 600 Denier Nylon outer layer, 300 gm fill, Polyester lined, fleece wither protector, Criss-Cross surcingles, removeable/adjustable leg straps, double buckle front with velcro tab, attached tail flap. No Back Seam - Waterproof and Breathable. 600 Denier outer layer, 350 gm fill, polyester lined, criss-cross surcingles, fleece wither protector, removeable/adjustable leg straps, double buckle front with velcro tab, attached tail flap. No Back Seam - Waterproof and Breathable. 1200 Denier outer layer, 300 gm fill, polyester lining. Double buckle front closure w/velcro, fleece wither protector, criss-cross surcingles, removable/adjustable leg straps with swivel snaps. No Back Seam - Waterproof and Breathable. 1680 Denier outer layer, 300 gm fill, full Nylon Lining for a slick shiny coat. Double buckle front, fleece wither protector, criss-cross surcingles, adjustable leg straps, tail flap. No Back Seam - Waterproof and Breathable. 600D ripstop nylon outer layer, 250 gm fill, fully lined with 210T nylon, full nylon trim. These are truly great blankets - full neck attached (not removable), tail cover, criss-cross surcingles, and adjustable/removable leg straps. No Back Seam - Waterproof and Breathable. 600 Denier outer layer, breathable nylon lining, 300 gm fill. Double buckle front closure w/Velcro tab, criss-cross belly surcingles, fleece wither protector, and adjustable/removeable hind leg straps. Attached tail cover flap. No Back Seam - Waterproof and Breathable. 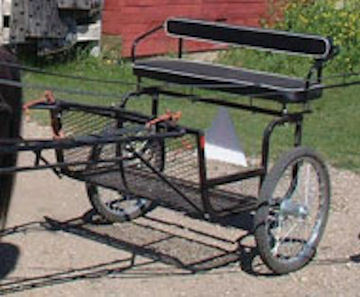 This cart is BRAND NEW is only offered for sale as it is too small to fit her horses. This cart is sized (by Greenhawk) as a 'Horse Size' but fits up to about 14:1 hh - large pony (cob???) size. Was purchased in late fall/early winter and by time it warmed up enough to try it on/fit horse - they wouldn't take it back! Please contact Linda at 403-887-5526 for more information - price, shipping etc. The easy entry cart is a comfortable 2 seater created in a strong rugged design. Features heavy duty wheels, steel shafts, vinyl seats, expanded metal floor and single tree. Stock photo.